The white-fronted Amazon parrot, although of medium size within the entire parrot group, is one of the smaller of the Amazon species. But despite its small size, this bird has an enormous assertive personality. Even in the wild, it often approaches people, and in captivity, it tends to form close bonds with a single person, to whom it shows great playful friendliness. Its personality, colorful plumage, and great talking ability—along with its relative affordability—make this a favorite pet among the Amazon parrots. The white-fronted Amazon parrot also goes by the names white-browed Amazon parrot and spectacled amazon parrot. The taxonomical name for this bird is Amazona albifrons subsp. albifrons. There are two other subspecies: the lesser white-fronted Amazon (Amazona alibrons subsp. nana), and the Sonora white-fronted Amazon parrot (Amazona albifrons subsp. saltuensis). The lesser white-fronted is slightly smaller and darker in color, while the Sonora white-fronted has more greenish-blue on top of the head. White-fronted Amazon parrots have a native range that extends from Mexico to western Costa Rica, and they are also found in Belize, El Salvador, Guatemala, Honduras, Nicaragua, and Puerto Rico. Their preferred habitat includes both brushy grasslands an tropical deciduous forests, and they may live in pairs or in small flocks of 20 to 30 birds. The bird was first described and categorized in 1788 by Swedish naturalist Anders Sparrman. Its numbers are prolific in the wild, and the IUCN (International Union for Conservation of Nature) labels it an Endangered Species of Least Concern (LC). Pet owners need not fear they are compromising the wild population. A smaller Amazon species, white-fronted Amazons typically reach only about 10 inches in length from the beak to the tip of the tailfeathers. These are fairly long-lived birds in captivity often surviving 50+ years. White-fronted Amazons are not considered especially suited as pets for large families with children but may be great for a single owner. They do bond strongly with their owners, but some have a tendency to become "one-person birds." It is best to socialize them thoroughly at a young age, or they become reclusive as they get older. They are a good choice for owners that have plenty of spare time to spend with their new bird. Like many Amazon species, some white-fronted Amazons some may go through a hormonal bluffing stage as they reach maturity. For this reason, they are recommended for those who have experience keeping medium- to large-sized birds. This is quite a hardy bird that can do well in protected outdoor aviaries. The white-fronted Amazon parrot has a variety of vocalizations at its command, including squealing, barking sounds, loud harsh trills and notes, and other short, sharp noises. White-fronted Amazons are primarily green, with patches of white and blue on their foreheads. They have bright red rings around their eyes, which has led many to call them "Spectacled Amazons." Sparse patches of light blue can be found on their chests and bellies, and their wings are edged in deep blue and red. There is a brilliant red blaze on the underside of the tailfeathers, and they have flesh colored legs and horn-colored beaks. Unlike most Amazon parrots, you can visually distinguish between males and females of this species. The female of the species is similar to the male in color but lacks the red edge on the wing. Beautiful and intelligent, a white-fronted Amazon parrot can be a delightful pet for the owner to which it bonds. Although it may be shy around others, its love of interactive play with its owner can be a delight for others to witness. Amazon parrots thrive on social interaction, and they need it to remain healthy and happy. Birds that are neglected often fall into destructive behavior patterns and depression, which can manifest itself in various physical and emotional problems. It's important for an owner of a white-fronted Amazon to set aside time each day for one-on-one interaction with the bird, which will establish and maintain a healthy bond. While hand-fed Amazon parrots normally make loving, affectionate pets, many go through an aggressive stage during adolescence that some owners can't handle. While the phase does pass, it can sometimes last for up to 2 years. Potential owners should remember that if they adopt a white-fronted Amazon, they are in it for better or for worse. These birds can live more than 60 years if properly cared for, so caring for one is not a commitment to be taken lightly. Make sure your white-fronted Amazon parrot has a roomy cage. Most experts recommend a cage at least 2 x 3 feet in footprint, with a height of 2 1/2 to 5 feet. The cage should have ample play equipment inside, including climbing apparatus, as these are acrobatic birds. White-fronted Amazons tolerate a wide range of temperatures but make sure to keep your bird protected from drafts. Bath your parrot regularly with warm water to keep their feathers moist and clean. In the wild, white-fronted parrots eat mostly fruits, berries, plants, seeds and nuts, corn, and some protein. 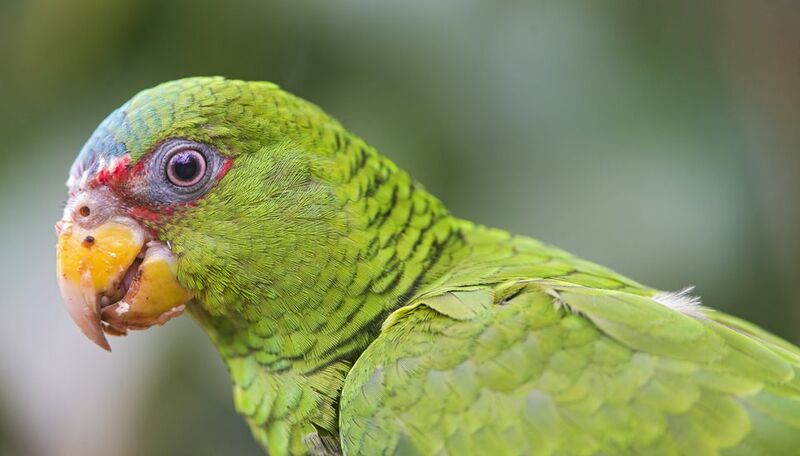 Like all Amazon parrots, white-fronted Amazons kept as pets do best on a high-quality pelleted diet, supplemented with seed mix and daily servings of fresh bird-safe fruits and vegetables. A fresh and varied diet will help ensure that your bird enjoys top nutrition. As with all parrots, avocado and chocolate are toxic to this bird. Amazon parrots are prone to excess weight gain, so it's important that they are allowed room to exercise every day. If you want a white-fronted Amazon, you should be able to give it a minimum of 3 to 4 hours outside of its cage per day. This will allow the bird to burn off excess calories and stretch its muscles, as well as providing it with essential mental stimulation. These birds are also heavy chewers and will need plenty of toys to chew on and play with. Even providing the bird with branches and twigs may help channel the chewing instinct and save your furniture from damage.